Please Note: Applications and documentation are in PDF format. To view any PDF document, you need to have Adobe® Acrobat Reader® on your computer. If you have both Boilers and Chillers to clean, the TCM-1000H is the right product. 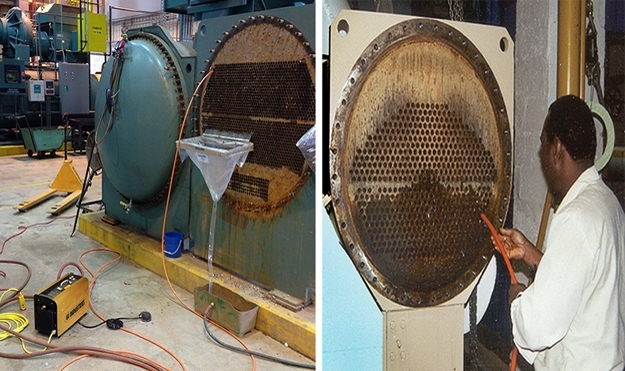 This innovative system thoroughly cleans firetube/watertube boilers and all chillers, condensers etc. 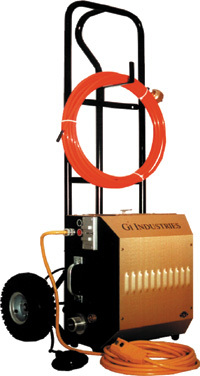 The TCM-1000H spins the brush inside the tubes and breaks the deposits from the tube walls. Negative Air flow from the vacuum removes the deposits quickly and efficiently. Operators stay clean. To clean chillers, disconnect the vacuum, change the flexible shaft/brushes and attach the water hose. You are ready for chiller cleaning. Cabinet 19" x 15.5" x 10.75"
Frame/Dolly 46" x 21"x 17"
1-Chiller Flexible Shaft 25' 2-Carbon Steel Boiler Brush 2"
What makes our Dual Purpose machine better? Easier for operator and better cross scrubbing on walls.